I use Sermon Speaker for a sports radio show here in Phoenix and for some reason it is showing the wrong iTunes category I have set up. I have selected the iTunes categories I want in the Sermoncast tab (see attached image), but you can see from the page source text below, that it is still showing Religion & Spirituality categories toward the top and then repeats the correct Sports related categories lower down. This results in iTunes only recognizing my submission as a religion category item. Any ideas on how to solve this? 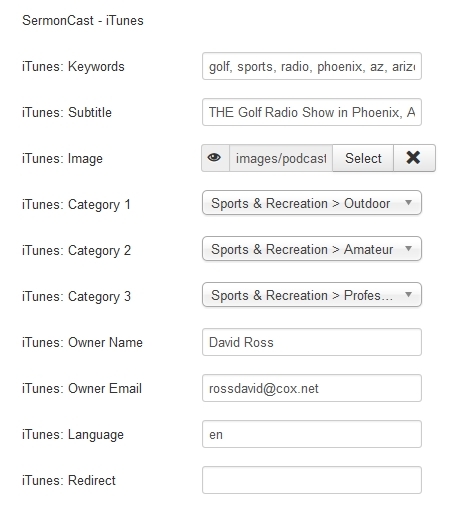 The actual RSS feed is at www.bunkergolf.com/podcast . You can specify up to three categories in the SermonCast section of the SermonSpeaker options. This looks to me like you have the first two categories left with default values and only set the third one to the sports category. Check both menu item and global SermonSpeaker options to be sure. Thanks, Thomas. I had neglected to check the menu item. I really appreciate your help on this! This is an old thread but I have the same problem for a children's education and parenting site. I have the 3 categories filled in (see attached) in the global settings, but I don't see where to select the categories under the menu options. @davidross, can you explain how you edited the settings in the menu to achieve this please? Any help would be greatly appreciated. The categories for the Podcast are categories defined by Apple. It just says where the podcast should appear in the iTunes directory. Those don't match with SermonSpeaker categories. The menuitems on the other hand refer to the SermonSpeaker categories.